Our feet are so important and we are so often judged by what we put on them. At work it remains quite straightforward. We need a good shoe, well made, kept in good condition and clean. Alas, for some this becomes a bit of a challenge and with good intentions they can let down a good impression. Clearly when we get away the stakes aren’t quite so high, and for that reason its not something to get worked up about. In fact David Cameron has experienced two summers worth of press reporting on him “not wearing the right thing” on holiday. But at this time, here’s an opportunity to have a look at what’s out there. Flip-flops verses espadrilles verses moccasins? So called because of the way they sound when you walk in them. These are super casual. The Dalai Lama of Tibet is a frequent wearer of flip-flops and has met with several US presidents including George W. Bush and Barack Obama. A summer shoe it most certainly is, but if you are familiar with the village of Savile Row in London, you’ll know that many of the Abercrombie and Fitch staff can be seen pounding the streets in flip-flops whatever the weather or season. It’s just ‘what they do’, and yes, it does look ridiculous in November in the pouring rain. Flip-flops aren’t the most stable of shoe and will promise little support, more so are the cause of many a tumble. Reportedly, there are 200,000 flip-flop related injuries every year. Yikes. But having said this they are the perfect shoe for the beach. Getting sand in your shoes is annoying and uncomfortable but you can manage the problem with flip-flops. Sand can also be very hot to walk on so you need to save your soles! They are a simple idea, and being such a low cost it is extraordinary to think that, again reportedly, that flip-flops are a $20 billion industry. The term espadrille is French and comes from the word in the Occitan language, which originates from “espardenya” in Catalan. In Catalan is meant a type of shoes made with “espart”, the Catalan name for “eparto”. This is a tough and wiry Mediterranean grass used in making rope. The oldest, most primitive form of espadrilles go as far back as 4000 years ago. With a canvas upper, and toe and vamp cut in one piece, the sides are seamed to a roped sole. Espadrilles are not that forgiving on the feet because a traditional pair has quite a hard sole. Not ideal for a long walk. That said, there is something rustic yet sophisticated about them. These shoes protect the foot but continue to allow the wearer to feel the ground. In its early days the Plains Indians wore a hard-sole moccasin because of the rock terrain they inhabited. While the eastern Indian tribes wore soft-sole moccasins because they were more accustomed with walking on softer more leafy ground. The moccasin as we know it today originally came from the county of Shopshire and eventually evolved into being more of a hard soled shoe used often by farming communities. The Moccasin is a staple pair of shoes through out the year for a gent. They can be worn with socks as long as you are wearing trousers. The very moment you put a pair of shorts on, put away your socks. They are an absolute ‘no no’, and combined will kill instantly any sense of style you might have. It’s rather like wearing socks with sandals. If you do, don’t. Something to also consider for the more fashion aware is to gently roll your trousers a so they have a short turn-up. Moccasins are brown so you would do well to team it up with a brown belt. The ‘slip-ons’ are highly practical. The more casual varieties tend to be softer on the foot, while the more formal might have leather. My favourite shoe this summer, one that is as stylish as it is easy-going: My pair of TOMS. The product and brand story are utterly worth supporting. Founded in 2006 by a native Texan Blake Mycokie, he set about establish a brand after a trip to Argentina where he saw extreme poverty and health conditions, as well as children walking without shoes. Recognising the traditional Argentine alpargata shoe as revolutionary solution, he went on to reinvent the shoe and take it to the US market. What is so remarkable is that Blake made a commitment to match every pair of TOMS purchased with a new pair given to a child in need. 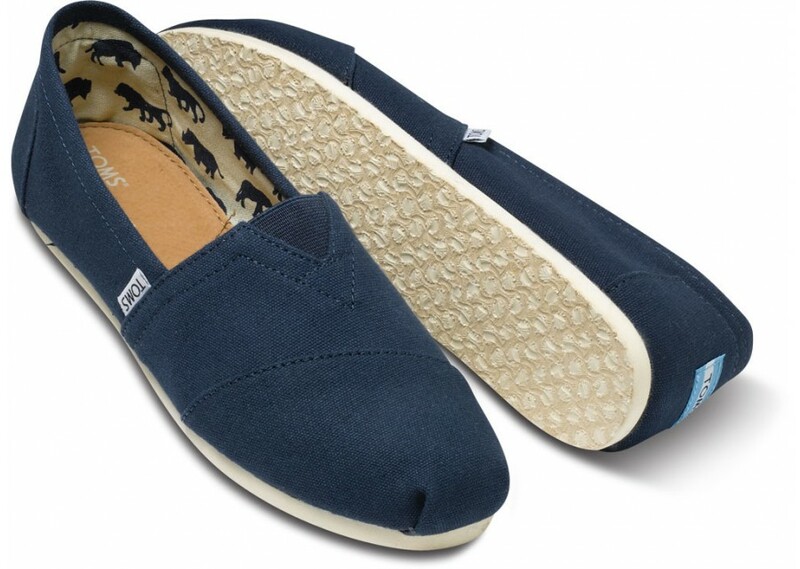 During its first year in business, TOMS sold 10,000 pairs of shoes. Blake returned to Argentina later that year with family and friends and gave back to the children who had first inspired him. Thanks to supporters, TOMS gave the One Millionth pair of new shoes to a child in need in September 2010. TOMS now gives in over 50 countries and works with charitable partners in the field who incorporate shoes into their health, education, hygiene, and community development programs. The shoes themselves are soft on the foot and are extremely comfortable to wear. They are rather like a more established espadrille but offer far more support and comfort. These days, with the company having grown immensely, there is so much choice of colour and style that you might choose to have several pairs on the go to ring the changes on your feet. Two that are particularly smart are a classic pair in navy blue, along with a beige pair in a basket weave (new this season). These are a wise purchase not only for stylish reasons but also because of the support you will be giving directly to the poverty stricken children who receive a pair because of your purchase.